The following information does not apply to a tankless type water heater power vent systems. PVC vent pipes can be used only with water heater power vent /exhaust motor equipped hot water heaters also known as an induced draft gas water heaters. The following information may also apply to CPVC and ABS pipes if such installations are permitted by the manufacturer and local authorities. 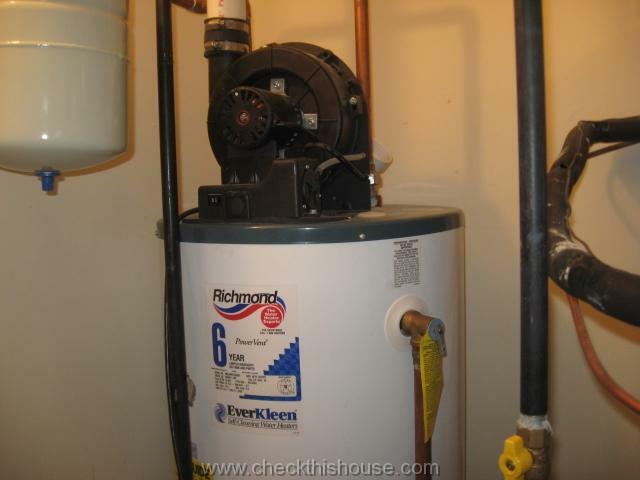 Check water heater inspection for more information about water heater installations. For the rest of this post I’ll be using “PVC vent pipe” just to make it easier. When installing a new or altering your existing water heater vent pipe installation, always check your particular water heater model for the manufacturer requirements and verify installation with local jurisdiction authorities. There are two types of PVC pipe water heater power vent systems – single (single wall and concentric) and double pipe. Power vent equipped water heater discharges exhaust gases through that single pipe. However, requires combustion air for fuel burning process and this must be supplied in sufficient amounts from the house interior or exterior. You cannot install the water heater power vent system that uses just a single wall PVC vent pipe for exhaust discharge purposes in a closet, behind the solid doors, with no air supplying vents, or in any type of room that doesn’t conform to the combustion air requirements for fuel burning appliances. Inadequate amount of air will cause incomplete combustion, and one of the bi-products of that is Carbon Monoxide, which could be deadly. There are also single-concentric water heater power vent / PVC vent pipe systems used by a high efficiency and high efficiency condensing storage / tank type water heaters. They have combustion air supplied from the exterior (some water heater PVC vent pipe systems might be 2 pipes starting at the water heater and converted into one concentric pipe before wall / roof penetration). This system is called direct vent, uses one PVC pipe to supply combustion air from the house exterior and second PVC vent pipe to discharge exhaust gases beyond the house. 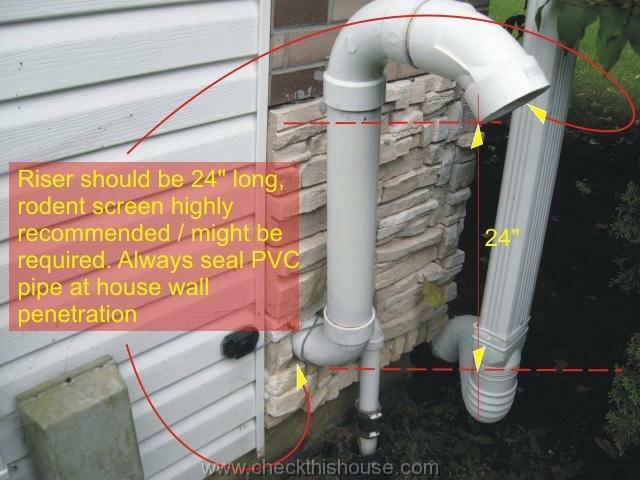 Both PVC vent pipes MUST terminate on the outside. Advantage of the 2 PVC pipe water heater venting system (and a concentric / single pipe), is that you can install this type of the water heater power vented system in the closet / behind the solid door, or crawlspace with no vents, etc. Water heater power vent systems utilizing double PVC vent pipe also come in high efficiency and condensing high efficiency “flavors”. Typical water heater power vent equipped system utilizes (unless otherwise specified by the manufacturer and/or by your local jurisdiction) 2″, 3″ or 4″ diameter, schedule 40 PVC, CPVC or ABS pipe. 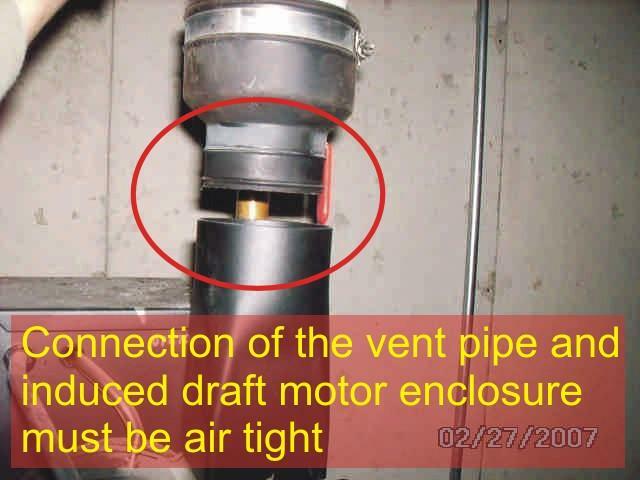 Size of the vent pipe depends on model, BTU rating of your appliance, length of the entire horizontal and vertical pipe section, and the number of installed elbows. 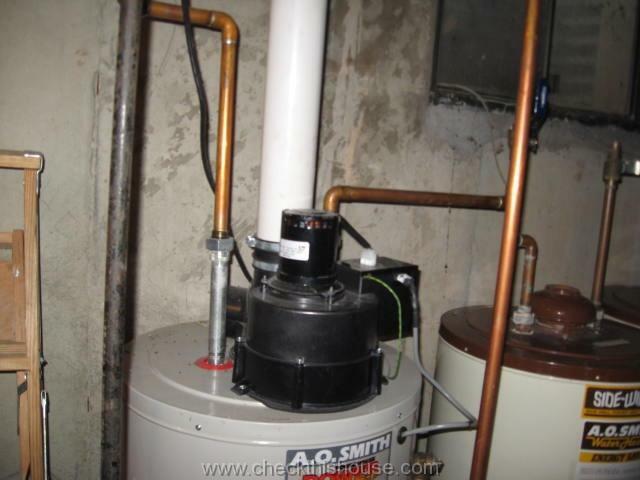 GPVH-40 and GPVH-50 model (40 and 50 gal / 40,000 and 50,000 BTU) water heaters. 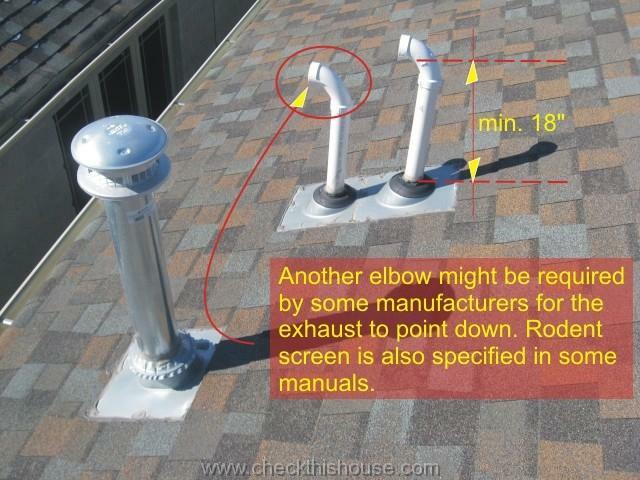 However, for every installed 2”&3” elbow you have to deduct 5’ from the maximum distance, and for a 4” elbow – 8’ of the pipe. 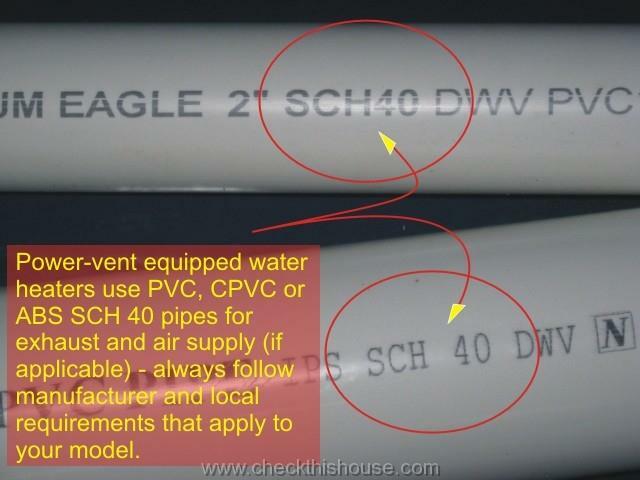 Always check water heater power vent system PVC vent pipe requirements that apply to your particular model. If you are missing the water heater PVC vent system installation manual, contact the appliance’s manufacturer / check online if possible. Gas water heater power vent / induced draft gas water heater PVC pipe can be installed vertically (through the roof) and horizontally (through the wall). For horizontal installations is should be supported every 3’ – 3 ½” to avoid sagging along the run (or per manufacturer’s instructions). Slope of the pipe – always check manual, but for non-condensing installations (not high-efficiency water heater) level or slightly up-slope towards the exterior should be OK.
Below are links to some of the manuals available online showing different types of water heater power vent installations. 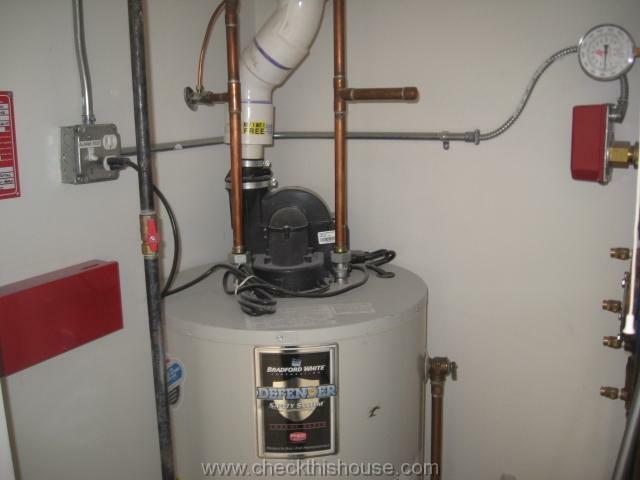 Did gas water heater maintenance ever crossed your mind? It’s very important for your safety and to maximize your appliance’s performance. Also, follow this link – garage water heater installation if you’re planning it, or to check on an existing one. Feel free to ask if you have any questions about the gas water heater power vent system and water heater PVC vent pipe.